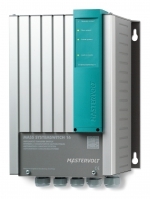 The Mastervolt transfer system helps you regulate your grid, generator or inverter power and automatically selects the right power sources at the right time. With Mastervolt you can cook and do laundry at the same time or watch TV with the airco on full blast. 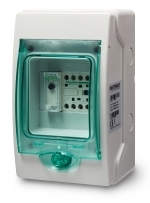 In addition, Mastervolt transfer systems are suitable for every installation. Activating and selecting 230 V sources: Grid power, inverter and generator (adjustable to amperage of grid power, for instance 6 A). Preventing damaging contact between the inverter and other 230 V sources. Fully compatible with Mastervolt systems, and suitable for installations from other brands, other generators and/or inverters. Two AC inputs; for example grid power and inverter. Adjustable transfer delay for generators. One outlet to AC power group. Power transfer up to 25 kW, input/output from 20 to 125 A. Three AC inputs, for example inverter, grid power and generator. Three or four outlets to AC power groups. Power transfer from 4.5 kW to 16 kW, input/output from 25 to 63 A. Information source for central energy management via MasterBus network. Optional automatic fuses; for larger systems this usually requires an extra casing.